St. Scholastica will host a dramatic poetry reading of an epic World War I poem. 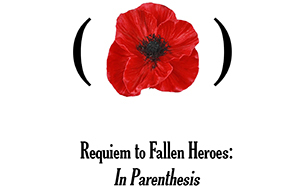 The Requiem to Fallen Heroes program will feature the 1937 poem "In Parenthesis," which weaves together a tapestry of voices to convey the horrors of war and the enduring power of the human spirit. It was written by David Jones, an artist/writer and WWI veteran who converted to Roman Catholicism. Dramatized readings with commentary will be given at 7 p.m. Wednesday, Nov. 14 in the St. Scholastica Theater (behind Tower Hall). The event is free and open to the public. The event is directed by Dr. Robert Larson, assistant professor of Communication, Theater and Art, and will feature readings by Brady Kamphenkel, adjunct faculty member in the English department; Dr. Tammy Ostrander, special projects chair of the CTA department; and Dr. Kevin Quarmby, assistant professor in the English department, along with visualizations by Dr. Paul LaJeunesse, assistant professor of art. Brief commentary will also be provided by Dr. Kevin Vaughan, Catholic Studies director. This event is sponsored by the Braegelman Program in Catholic Studies in collaboration with faculty and staff from the Departments of English, CTA, and Information Technologies.